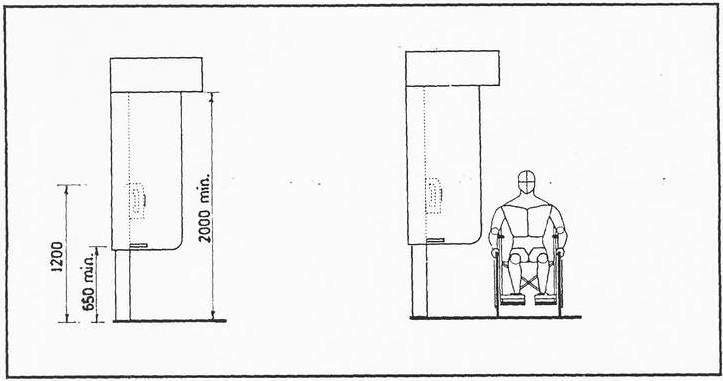 Sufficient floor or ground space for a forward or parallel approach by a wheelchair user should be provided near telephone booths (Fig.6.2a). Cubicle doors and fixed seats should not block approaches to and from telephones for people who use wheelchairs. As an alternative to fixed seats, folding seats may be provided in telephone booths. The highest part of a telephone should be within reach of a seated person. Knee space should be provided under telephones. Telephones should have push button controls. A long cord from the telephone to the handset should be provided. It Is highly recommended that telephones have "hands-free" receivers. Telecommunications devices for deaf persons (TDD) should be installed adjacent to . pay-phone booths. TDD should be identified by the "TDD" symbol. Pay-phones should be hearing-aid compatible. Pay-phones should be have volume controls. Visual Notification Devices should be provided in offices, workplaces, hotel rooms and homes to alert hearing-impaired persons to in-coming telephone calls. Assembly areas, as well as conference and meeting rooms should provide assistive listening devices for persons with hearing impairments. Various types of assistive listening systems are available on the market. They include audio-induction loops, radio frequency systems and infrared transmission devices. Facsimile machines are a valuable communication tool for persons with hearing impairments and should be readily available to them in post offices, commercial areas, public places and their homes. Adequate lighting, raised platforms and headphone sets should be provided for sign language interpreters. Braille symbols and/or text in raised format should be provided in places frequented by persons with visual impairments. Text/symbols and the background of all signs should have a non-glare finish. They need to be in sharp contrast to their background. "Talking signs" should be installed.